Do you ever look at those people with hobbies that make money — crocheting blankets, hand dyeing fabrics, creating websites, etc. — and think, how the heck do you fall into something like that? I went to school with a girl who used to hand dye scarves and bags. She mostly gave them away to friends and family as gifts, but occasionally she’d make a few to sell. It wasn’t really about the money; she just loved doing it. Now, years later, she makes good money on the side of her full-time job by selling her creations on Etsy. This is becoming the norm for many people today. People are looking for creative ways to make money, and they’re taking their profitable skills and hobbies to the bank. Whether they make a few hundred dollars a month or a few thousand, people side hustle to pay down debt, boost emergency funds, save for travel, or invest for the future. Not all hobbies are great for bringing in some extra income, but plenty of them are. Here’s a list of 16 hobbies and skills that make money to help you turn your passions into cash. If you’re good with people, technology, writing/editing, teaching, pets — almost anything — then you have skills that make money. Capitalize on them! Chances are you have the ability to communicate, create, lead, organize, design, build or have some other talent. Putting any one or more of those to work for you can bring in cash each month. The best thing about hobbies that make money online is choosing when and where you complete the work. These are popular side hustles because they allow you more independence than your 9-5 and many other side gigs or part-time work you could do to earn extra money. This is a hobby, right? Turns out, if you get a kick out of giving your two cents on things (no judgment here), there’s actually a way to get paid for it. Surveys have become quite popular in recent years, as companies are always looking for deeper insight into consumer trends. If you have downtime between jobs when you’re riding the train into work, or if you have a few minutes at night while watching TV, taking paid online surveys might be a good way to make extra money with minimal effort. These don’t take much brain power and they can be done anytime you get the urge (or are just feeling bored). They won’t make you rich, but it can be a fun hobby to make a little extra cash. One of the most well-respected market research companies is Survey Junkie. There’s no charge to sign up and you’ll receive direct survey opportunities allowing you to give feedback on products and services to a variety of brands. You earn free rewards points redeemable over time for cash prizes such as retailer’s gift cards or PayPal direct deposits. Want to know more? Check out our full Survey Junkie review. Another popular survey website is Swagbucks (we did a review on Swagbucks as well). 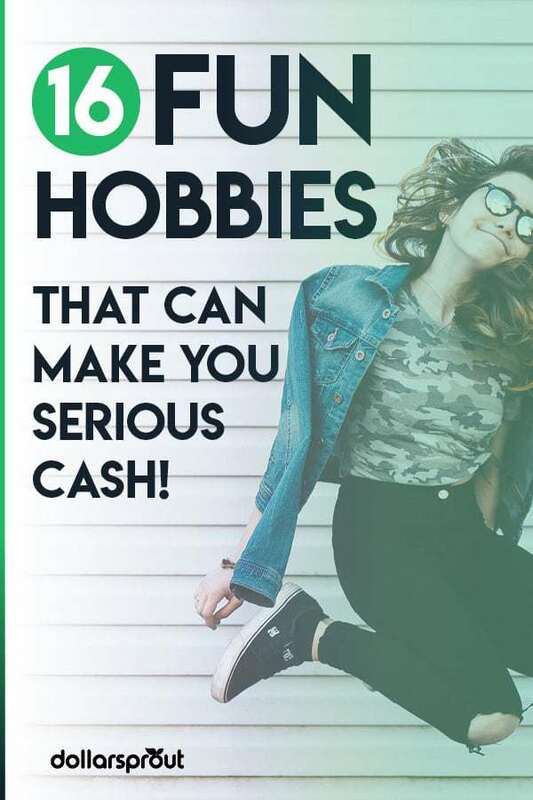 If yo want to focus on hobbies that make money online, taking surveys or completing other activities on the Swagbucks website (watching videos, playing games, using their search engine, etc.) will pay out for just a few minutes of work each day. You won’t be able to leave your day job and replace your income with Swagbucks, but it’s a good way to earn cash in your spare time. You can easily make a few hundred bucks a year. They also offer a $10 bonus just for signing up. This is how I first started dabbling in making money online. You don’t have to be incredibly skilled to get started. In fact, you can take a $10 basic web development course online, then started taking on simple jobs for clients on freelance sites. Start simple, and move up from there. With each and every client, you’ll learned something new. Whether it’s just a hobby for you or you’re deeply skilled at web development, you can definitely earn an income by creating and improving websites for others. Of course, the better you become, the higher rates you can charge clients! 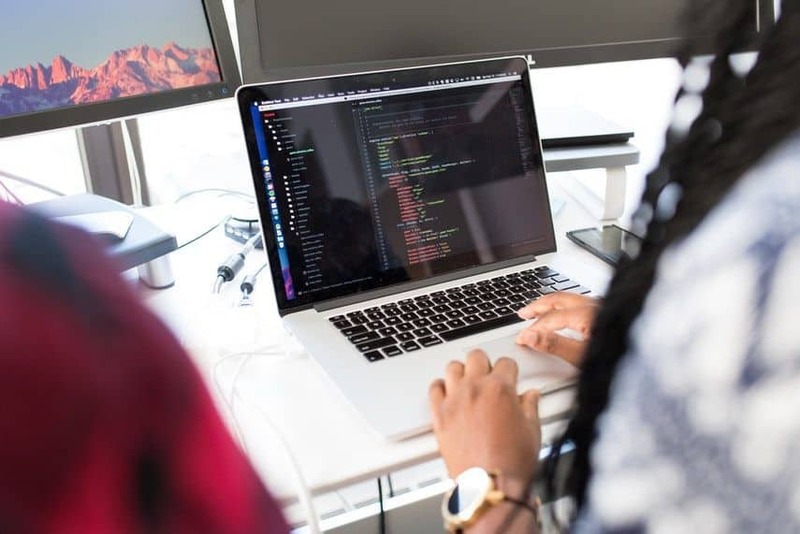 Entrepreneurs and small business owners make great references as you build a web development portfolio and start branching out to higher-paying gigs. If you enjoy sitting at your computer and sharing stories or doing research on topics that excite you, blogging may be the perfect hobby for you to make extra money. Jenny, a mom and blogger, brings in over $1,500 with her blog each month. As long as you enjoy writing killer content on something you are passionate about and do the work of finding an audience, you can monetize a blog with ads, affiliate links, or sponsorships. Adding your own products such as courses or e-books and services like consulting or coaching can drive your revenue up even more. Here’s an in-depth tutorial on how to get started. But, if you’d rather skip your own blog, there are plenty of other businesses who need content written for them. Your excellent writing and editing are skills that can earn you money as a freelance writer. Once you find a few clients and build a portfolio, you can charge more. Take Holly for example. Holly had no experience or degree in writing, but that didn’t stop her from picking up freelance writing gigs on the side of her full-time job. Now she makes six-figures per year as a freelance writer and teaches others how to do the same. Does it drive you crazy when someone uses an inconsistent voice in a piece of writing or when it appears they’ve never heard of spell check? If you have an eye for detail, a natural talent with language, and the desire to help others – proofreading may be the perfect side hustle for you. And the bonus? 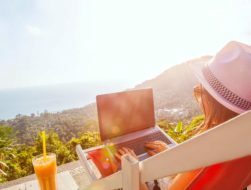 You can work from anywhere you have an internet connection. If you are a strong proofreader, use your skill to cash in! There is no shortage of proofreading work online. If you’re thinking of jumping into proofreading, check out this free webinar on how to turn your passion for words into profit. Graphic design is one of the most in-demand services right now. Whether it’s a small business down the street needing a new logo or an entrepreneur in a different country trying to design a graphic for a blog post, people will pay for your creative software design skills. It’s not as easy as it looks to create great graphic designs, and you’ll be competing against thousands of others for jobs. But if you’re a natural or if you’ve taken the time to hone your skills working with graphic design software, then you may have a competitive edge. Once you land a few clients, you’ll be in demand while capitalizing on a hobby that allows you to make money online. You can even begin bidding on projects at sites like 99designs, DesignCrowd, Fiverr, or Crowdspring. Writing software and developing apps are skills that make money — big time. If you have an idea to sell a useful tool online or if you build an app for someone else, there’s potential to make serious cash in app development. If you’re not sure you have the right skill set, there are free online courses that teach app development. Your love of technology and problem-solving might lead you to a side hustle that pays off big. Search Engine Optimization (SEO) is the process of optimizing a website’s content to be found by search engines like Google, Yahoo, and Bing. For people running businesses online, figuring out how to optimize their website and content matters. But SEO is just one more moving target business owners and online entrepreneurs can’t add to their already overflowing plates. SEO is a valuable tool to online businesses, and they’re willing to pay good money for your expertise. Taking the time to really understand SEO and follow the latest algorithm changes is the key to making money with this hobby. Entrepreneurs, small business, and even larger brands look to virtual assistants (VA) to complete tasks to keep their businesses growing. And having a social media presence is the key to success. If you’ve mastered a number of social media platforms, you may not have even realized you have a set of skills that make money. Blending your hobby with a passion to earn extra money is a great way to leverage your money and also what you already spend time doing to make some cold hard cash. Anyone can make a video and upload it to YouTube to be seen by people around the world. But recording videos is also a hobby that can make you money when done correctly. The better the content and quality of the video, the more likely you are to get views and make money. If you are a YouTuber, you can monetize instructional content with ads, through your own products and services, and through endorsements from sponsors. It takes a lot of work to create an engaging instructional video that teaches an audience, but it could really pay off in the end! If you’d rather be active, meet with people in person (and possibly their pets), and not be tied to a computer, here are offline hobbies that make money for you to consider. Even though you may need to use an app on your phone, becoming a driver for a ride-sharing service like Lyft puts the car you own to work on your schedule. As a driver, you get to meet and have conversations with tons of interesting people, and you get paid weekly. Your earnings are affected by several factors including location, demand, time of day, etc. One thing that gives Lyft a slight competitive edge over Uber right now — they’re offering a $300 sign-up bonus for new drivers who complete their first 100 rides in 30 days. That may sound like a lot, but you’d be surprised. Since most rides are fairly short, you could probably hit that in just a few hours a week during nights and weekends. If you’re a pet owner or a pet lover, consider how you can make your passion for animals into a hobby that makes money. That’s exactly what Rover is all about. Rover is a dog walking and pet sitting website that is always looking for qualified dog walkers in cities all over the United States. So when you take your pup on a walk, you can also take a second (or third) dog with you and get paid to walk. 30-minute walks fall in the $10-30 range. With a neighborhood route, that can add up quickly! To get started with Rover, just fill out the short application and start matching with pet owners in your area. If a normal part of your daily routine involves spending time working out each day, consider making some cash teaching others your favorite fitness activities. Maybe yoga or pilates is more your style. Why not find a park or community center where you could charge per student and teach a group class? If training for marathons or triathlons is how you stay fit, start a first timer’s group. There are plenty of people interested in these types of events who will pay to have a coach or instructor to guide them through those first few races. As a fitness instructor, your hobby makes money and builds community. It’s a win-win for you and your students! Your first thought might be, “Do people actually hire others to coordinate their garage sale?” However, many people do. Just like people hire others to do things they could do themselves like lawn work, child care, and cleaning their home, finding someone to run your garage sale might make sense. Do you enjoy working with others and your skill set includes being organized and objective? Then you may be interested in helping someone who wants to have a sale by coming in and taking the lead in the event. You don’t have an emotional attachment to the items. And if your pay is based on a percentage of sales, you’ll do everything you can to have a successful garage sale. If you’re the first person your friends and family call when something breaks or needs to fixing, then you probably have many skills that make money. Whether it’s painting, fixing a railing, hanging a sheet of drywall, putting in a new window or replacing a dishwasher, a skilled handyman can always find work. Many people don’t have the time, patience, or ability to tackle even the smallest household repairs. If you communicate well and are dependable and efficient, you can cash in on what you’ve learned and what you are both good at and enjoy doing. If your creative side shines when you have free time, think about ways to monetize what you love to do by selling your best arts and crafts. You can take hobbies like painting, forging jewelry, developing digital art, dipping candles, or making scented soaps, and start earning money with them. Take everything you’ve made and set up shop at a craft fair or market. Approaching local merchants to sell your creations in their stores is another way to make money selling crafts and build relationships. Make sure you have business cards attached to your items so happy customers can contact you or refer their friends and family. You can also create your own website to sell your crafts or make an Etsy shop or Artfire store to sell products online. The competition is fierce online but it is another way for you to enjoy and highlight your artistic hobbies and make money. If spending time shopping is what you enjoy, stop by a local thrift store to see what gently used brand-name clothes or accessories you can find. You can flip your purchases and resell them at a profit on websites like eBay, ThredUp, or Poshmark. Just ensure you understand what name brands and categories sell for the most money so your thrift store finds don’t cost more than you can sell for. To get the biggest return, you’ll want to shop for quality items in great condition without tears, stains, or marks. Also, keep an eye out for new items with tags still attached. After thinking about what you like to do and looking at all of the money making hobbies from home (or offline), what will you choose? One great thing is you probably don’t have to learn anything new to get started. And you may already have all of the materials and skills that can make you money right away. If you do need to buy supplies or equipment to turn your hobby into a money making side hustle, be careful about not taking on debt. As much as you enjoy your hobby, you might not enjoy it as work. And as a side gig, it may not be as profitable as you thought it would be. Limiting the amount of money you put in upfront to make your hobby a side hustle will allow you to pivot and try a different hobby or skill that makes money if there is something else you might enjoy trying. Whether offline or online, there are plenty of profitable hobbies that can earn you money. Are you ready to put yours to work? What hobbies do you enjoy? Share them in the comments below. If you make a few bucks here and there from a hobby you occasionally have time for, at what point does the hobby become a business for tax purposes? An at-home business, even? Hey Deb — our vCFO (he’s an accountant) actually talks about many of these topics in a guest post he did for us on our other site — it’s a pretty quick read but you may learn a bunch about hobby/business operation. Thanks for stopping by! Hope this helps — if you have any questions, feel free to leave them in the comments there (or here) — he reads them and will try and help if possible! Online businesses are a great way to earn extra income while working from the comfort of home. 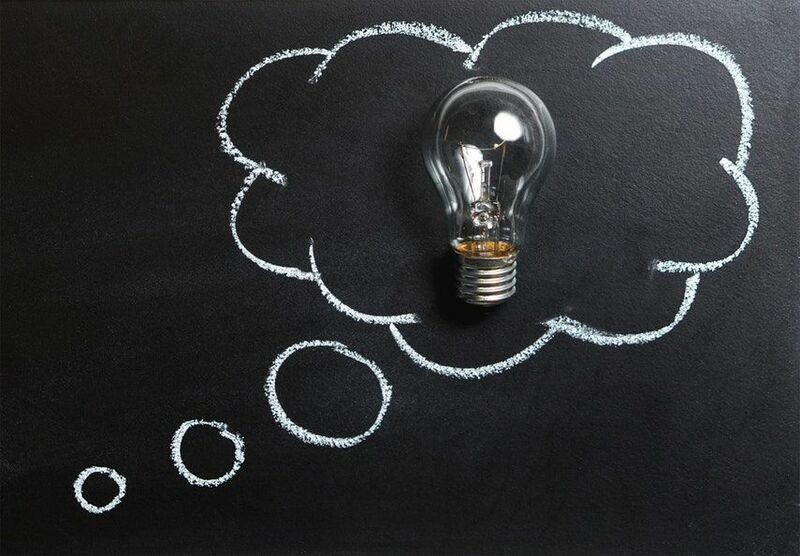 Here are 10 successful online business ideas that’ll help bring out the beginner entrepreneur in all of us.